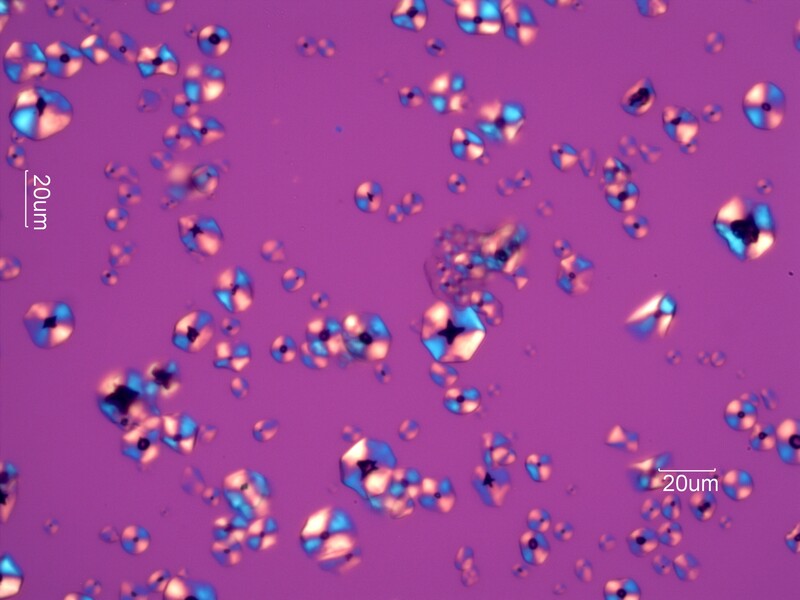 These are corn starch grains viewed with crossed linear polarized light and the red plate compensator. The black cross structure evident without the compensator is now red and the different quadrents of the grains have turned blue or yellow. For starch grains the upper right and lower left always turn blue and the other two quadrents turn yellow. For other spherulitic particles the colors may be reversed or there may be more colors present. Corn starch is derived from Zea mays. it is by far the most common starch grain encountered in the indoor environment. It is used in paper sizing, coating plastics, coating candy, as a body powder, as a carrier for fragrances and pesticides, as an extender in coatings and paints, a mold-release in formed polymer manufacture, and many other uses.